Streetcars on the Bridge Transfer line in front of the Oriental Theatre on SE Grand, near Morrison. -From the Streetcars Build a City exhibit at the Architectural Heritage Center. A view, taken prior to 1947, near the present day SE Grand and Morrison stop on the newly opened Portland Streetcar Central Loop. To the far left is the edge of the twelve story high Weatherly Building, which still stands. A Benson Bubbler is in the foreground. Like the Oriental Theatre, it has long since vanished. 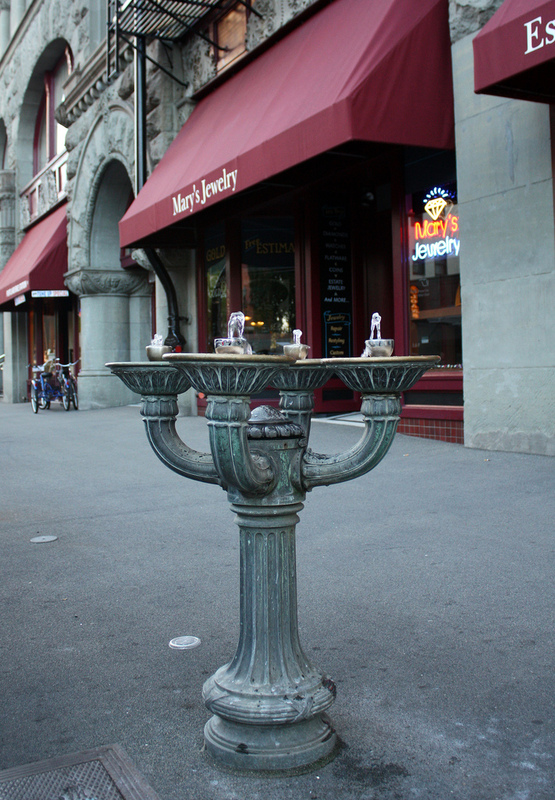 The picture establishes that Portland's iconic four-bowled fountains once ranged on east-side streets. 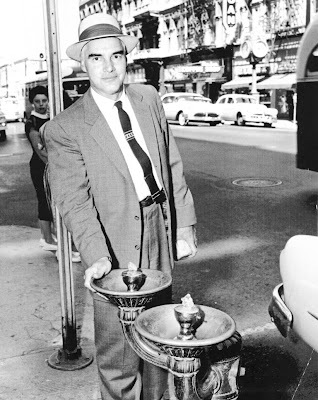 The photograph raises questions: If there was one Benson Bubbler on an east-side corner, were there others? Where were the original twenty fountains, donated by Simon Benson in 1912 located? How many still exist? What does their movement tell about Portland's history? The search for answers lead to forty nine Benson Bubblers, and to the story of a forgotten preservation battle. A Benson Bubbler in the April 1916 issue of American City. The story of Simon Benson's gift to provide workers with an alternative to saloons ranks high, along with the coin flip to name the city, in Portland's collective myth; a perfect counterpoint to Henry Wienhard's offer to pipe beer through the Skidmore fountain on opening day. The fountains were immediately embraced by Portlanders, who wryly referred to having a "Benson Highball" or a "Benson Cocktail". Be it their implied communal invitation, the healthful quality of Bull Run water, the philanthropy of Simon Benson or the design work of A.E. 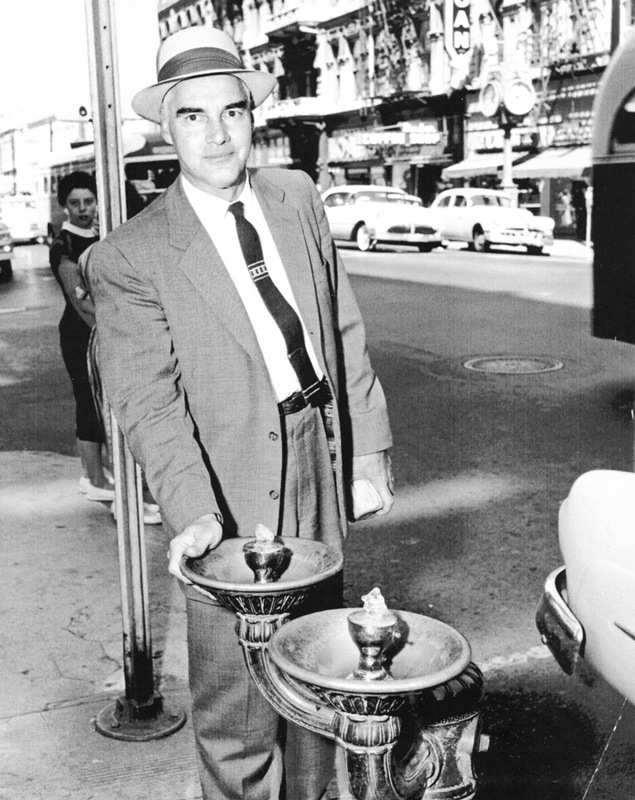 Doyle, the Benson Bubblers then, as now, symbolized Portland's better self. "Race Prejudices Disappear When Thirsty Folk Bend to Fountain"
-The Sunday Oregonian, July 27 1913. "...the "color line," however well defined it may be at other places, recedes to the vanishing point on a hot afternoon at the at the corner of Sixth and Alder, Fifth and Washington or any of the other 20 odd corners in the city where, night and day, the Benson fountains bubble their little song of welcome and generosity." The original locations of the first 20 Benson Bubblers can serve as way markers to the Portland of 1912. The fountain at SW 4th and Stark enhances a parking lot that was once the site of the opulent Chamber of Commerce building (1892-1934). Benson's twenty bubblers of 1912 were placed at the following street corners: (italics indicate locations where the fountains have since been removed). Note: Broadway was changed from Seventh on the west side in 1913. "For many years the southwest corner of Third Avenue and Washington street right there by one of the Simon Benson drinking fountains- was the general headquarters for Portland's old time chimney sweeps. You've seen them there, no doubt, with their tall hats, or with hats in which tall cards had been stuck." -Stewart Holbrook, in his column Down Portland By-Paths, The Oregonian, March 29 1934, about an old and dying practice. In the century to follow Benson's donation, the fountains faced neglect, defacement, perils from disinvestment and displacement by off-ramps. At one point they were viewed by the City Council as a public health risk. Today, there numbers are more than double that of 1912, a turnabout brought on by the efforts of Francis J. Murnane. By the 1950s the fountain at Third and Washington had lost two arms. At least four received this treatment, a practice began in the 1920s to save water. "... The city of Portland however has treated the fountains rather shabbily. Many of the fountains are mutilated. Some of them have been removed in callous disregard of the donor." -Francis J. Murnane, in the Oregonian, January 2 1952. Francis J. Murnane, a Portland longshoreman, later president of ILWU Local #8, noted the sorry condition of the bubblers in a letter to the Oregonian in January 1952. Over the next six years his concern evolved into a personal crusade aimed at the City Council to protect the fountains, whose numbers had dropped to sixteen. 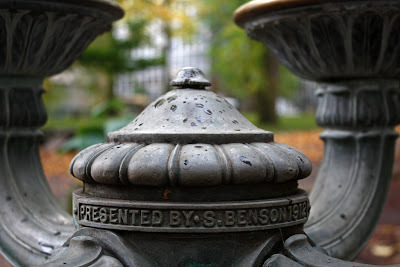 "It is my belief that the Benson fountains belong to all the city and should be restored to their beauty and usefulness. This is particularly important in order to favorably impress the millions of visitors expected during Oregon's Centennial and Trade Fair. Further, the inexcusable indifference in the care and maintenance of the fountains may deter others from donating gifts to the City of Portland." -Francis J. Murnane, in a letter to the City Council, dated July 24 1958. In his campaign, he created five hand-typed brochures, pasted with photographs of each of the existent fountains, which he presented to the members of the council. Despite the fact his preservation advocacy would gain him admittance into Commissioner William Bowes "letters from crazies" correspondence file, his efforts met with success. "The work of renovation and restoration of existing fountains is proceeding under direction of the Bureau of Water Works, and a contract, authorized by Ordinance Number 109030, passed by the Council November 12 1958, has been entered into with James L. Hanson for the reproduction of four Benson fountains which were missing from the original number. Therefore, your Commissioners recommend that Mr. Murnane be advised accordingly and commended for his interest in calling the matter to the attention of the City; and that the calendar be placed on file." -Nathan A. Boody, Commissioner of Public Utilities, in a letter to the City Council, December 11 1958. The sixteen bubblers were repaired and the arms that were restored to the four fountains that had them removed. Locations were found for those displaced by the new Morrison Bridge. Four exact replicas were cast to replace the missing fountains. 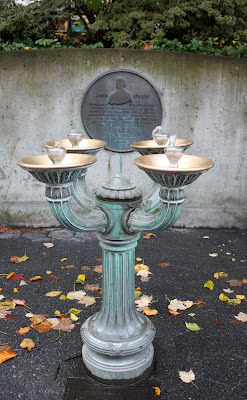 The first replica was installed, at the suggestion fo Francis J. Murnane, at the base of the South Park blocks, with a plaque memorializing Simon Benson. Francis J. Murnane (left) at the dedication of the Simon Benson plaque near SW Park and Salmon. -The Oregonian, June 23 1959. A refugee from the 1960s. According the the Oregonian, the fountain at Broadway and Columbia (in front of the Oregonian's building) was placed there in December 1967, after being displaced by Urban Renewal. However, no Benson Bubblers were located within the boundaries of the South Auditorium Urban Renewal district, or its expansion. It is possible though that the fountain came from First and Madison. In the decades to follow, more fountains were locally produced, some by Benson High School. By 1982 their total had grown to 37. Today their number stands officially at 52. In general the their placement shifted to the west, perhaps in deference to the Simon Benson heirs wishes, stated in the 1970s, that they be restricted to certain downtown boundaries. In 1912 there were four fountains along Fifth and Sixth. At present there are twenty-five, partially the result of a bubbler binge in 1976 that added fifteen to the bus mall, then under construction. There are none on Naito Parkway / Front Avenue (or for that matter in Waterfront Park). The only two on the east side of the river are at honorific locations: Benson High School and the Vera Katz East Bank Esplanade. Some locations added after 1958 no longer have Benson Bubblers. 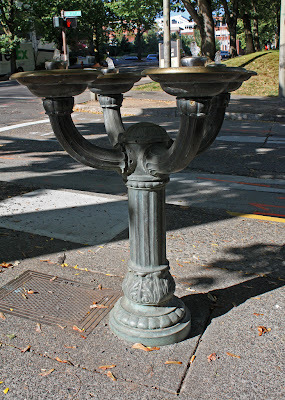 Chapman Square, NE 41st and Sandy, Naito (Front) & Yamhill all at present have single bowled fountains. A forlorn cement filled circle marks the spot where a Benson once stood in O'Bryant Park. Close examination of the bubblers reveals different varietals. 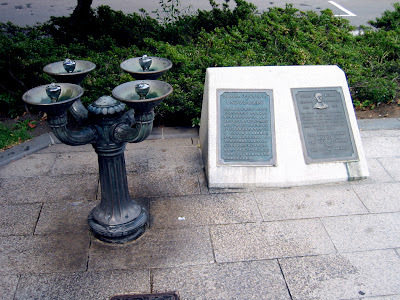 The original 1912 era fountains are marked as Presented by S. Benson 1912 and by having a two piece top (or a screw hole indicating a missing cap). The fact that there are currently 18 fountains with a 1912 inscription strongly hints that the four 1958 replacement replicas were also thus adorned. On later fountains the inscriptions differ, many newer ones have none. The 1976 vintage bubblers revived two piece tops. "Oh My God! I love these things!" -Teenage girl to her friend, approaching the bubbler at NW Second and Davis, a sunny Saturday afternoon, October 6 2012. Today, their status as an local icon is secure. 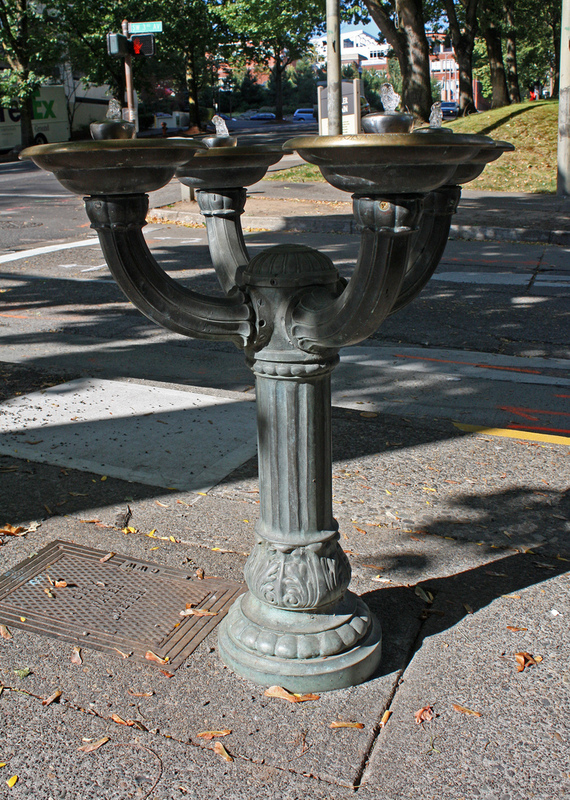 The Benson Bubblers dispense Portland's civic sacrament from 6 am to 11 pm, every day of the year. That they do is in no small part because the efforts of a Portland longshoreman in the 1950s. Had Francis J. Murnane not advocated for them, it is possible someone else would have, but in a decade where the past had little value, his contribution can not be taken for granted. 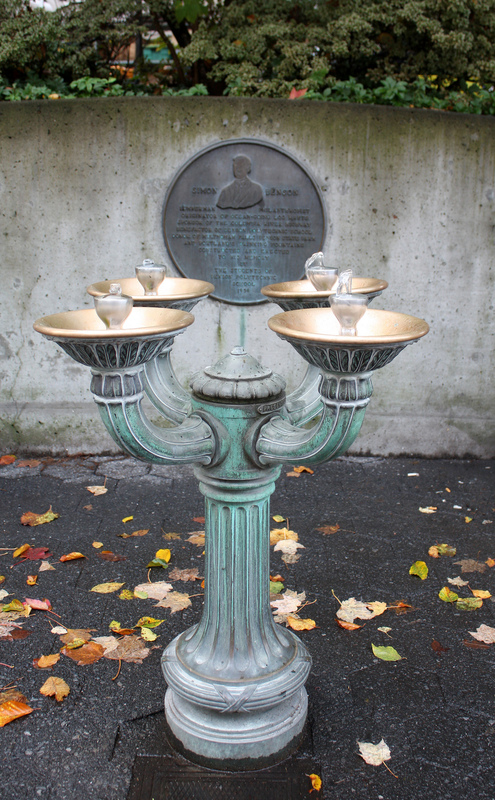 In 1965, two Benson Bubblers were cast, one of which was given to Portland's sister city, Sapporo Japan. -Photo courtesy of Christopher Lewis Cotrell. Not a Benson, but a Robinson: In 1921, Nellie Robinson bequeathed $2,000 to the City of Portland for water fountains. Two four bowled fountains, similar but distinct from Benson's, were placed in front of the Civic Auditorium. Today they are perhaps the only remnant of the vanished streetscape in the South Auditorium Urban Renewal District. A three-bowled "Nellie" was also placed at Front and Vine, where it remains, albeit on a map much changed. 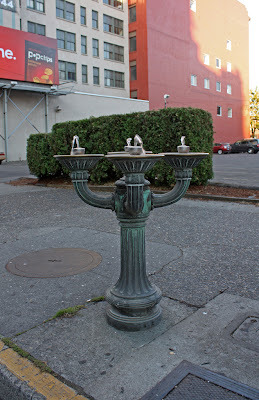 North Portland is the only one of the "five quadrants" never to have had a Benson Bubbler. Or is it? A news item titled "Exclusive Dog Arrested" in the Oregonian on December 14, 1912, tells of a large Newfoundland dog impounded for drinking from a Benson Bubbler at Mississippi and Russell. 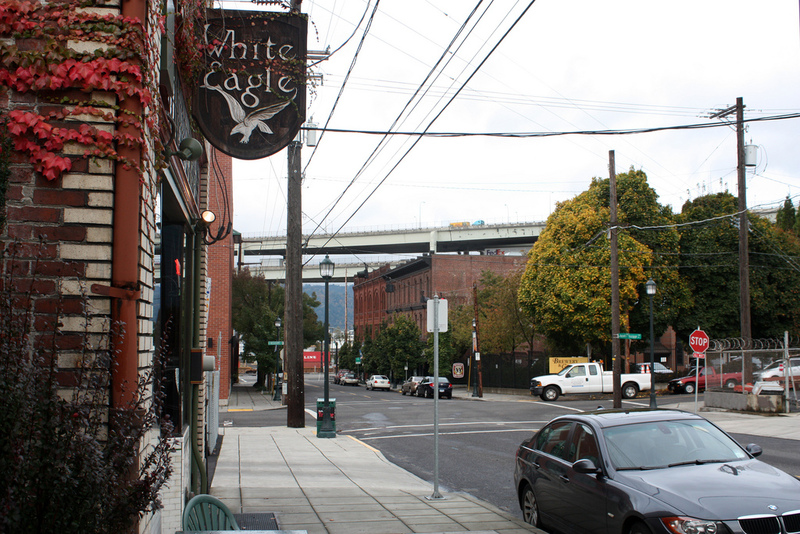 If the story is correct, Albina had a Benson, just as the former East Portland had three. Its removal would likely have occurred long before Murnane's 1958 list. "His concern encompassed the city, its fountains, parks, statues and history. He was known by the City fathers of his time as the "cultural and historical conscience of Portland." The plaque disappeared and was forgotten by the city and his union. The wharf was closed and recently removed. A small, garbage strewn platform beneath the seawall is all that remains of it. If Portland is serious about the riches of the city, perhaps this can be rectified by a new plaque at the base of the South Park Blocks, next to the one placed, at his suggestion, to honor Simon Benson. A toast, a Benson Highball, to Francis J. Murnane. Thanks to Brian Johnson and Mary Hansen at the City of Portland Archives and Records Center. Terry Black at the Portland Water Bureau. Val Ballestrom at the Architectural Heritage Center, Doug Bloem, Christopher Lewis Cotrell and Tanya Lynn March. This tracking of the history, habitats and migratory habits of the Benson Bubblers was drawn from the following: a brochure by the Water Bureau on their downtown locations. A more extensive (but out of date) list generously provided by the Water Bureau, Francis J. Murnane's 1958 list from the City of Portland's Archives and Research Center, accounts from the Historic Oregonian database from the Multnomah County Library, and the direct observation of 49 fountains. If anyone would like a copy of my minutia filled, highly specific working list, email or contact me via the Cafe Unknown Facebook page. I love the Benson bubblers, so I was glad to learn all of this new (to me) information. What I still don't know is what the one-bowl bubblers are called, do you? They're not as magnificent, but I like them too, and there are some of those on the East side. 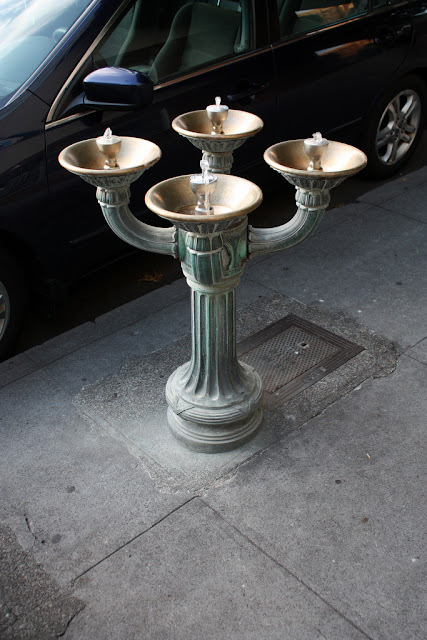 In the accounts I read, especially the older ones, all perpetual flow fountains were described as bubblers- I think its safe to say the single bowl fountains can be called that. I have not come across a case where the single bowl fountains were the result of a donation- which is how the Bensons gained their name. That is not to say it is the only way to get a nick-name. One thing I've noticed is that there is are differences in the single bowl variety, some being more ornate than others. One of them was installed in Chapman Square in the 1920s to memorialize J.C. Ainsworth. The "Ainsworth fountain" name has been forgotten, and a more spartan fountain is there now. According to a list from the water bureau, a Benson Bubbler spent time there as well. One thing I've learned in all this is that fountains are not necessarily stationary objects! I've had a drink out of the one in Sapporo during a visit in 1985; I was so surprised to see it! The fountains have been shut off from time to time in response to droughts and budget problems. In each case the water bureau said the shutdowns were purely symbolic, since the fountains use an insignificant amount of water compared to the whole city's usage. Sometimes two or three bubblers in each fountain were shut off as a conservation measure, but that was never a popular solution. Finally someone came up with a water-saving measure that works. A few years ago the bubblers were fitted with sleeves that restrict the water flow without harming their usefulness or their beauty. Dan, I couldn't find a contact gizmo for you, so am using your blog to get in touch with you. I have been writing a series on my blog about KF theaters of my youth. 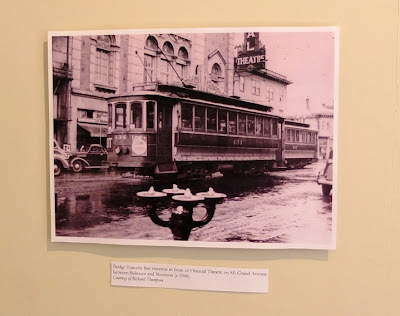 I came across some pictures of the Esquire/Ross Ragland Theater that you had uploaded on flickr. I would like to use 2 or 3 of your pictures (which are copyrighted) on my blog post about my memories of the Esquire Theater. Is that possible? How much is the cost for using the pictures? And how do I go about doing that? Hope to hear from you soon, as I am looking forward to posting the bit on the Esquire Theater and finishing up this series. Sorry this is off-topic from your post, but I don't know a better way to contact you. I recently found four small photo albums in an abandoned apartment full of photos of Portland from 1972. As interesting as I find them, I feel that you will appreciate them more. Can I send them to you or drop them off somewhere for you? I’ve been trying to find info on east side Bubblers and the bubblers outside of downtown, with no luck so far. There’s one at MLK and Lombard, and I saw online there’s one at MLK and Freemont too. I’m surprised none of the ones outside of downtown are noted on City bubbler maps.